cat eyes & skinny jeans: Love Is In The Air - Stingray Cuff Giveaway From D'Haute! 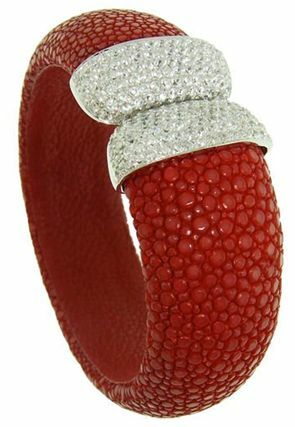 Love Is In The Air - Stingray Cuff Giveaway From D'Haute! ♥Like D' Haute on Facebook. ♥LIKE the photo of the cuff and leave a comment there on how you would wear it, i.e. outfit, complementary jewelry and so on. ♥Follow D' Haute on Twitter. A winner will be announced on Facebook and Twitter on Feb. 13th, 2012. Deadline for entry will be on Feb 12th, 2012 at midnight (CST). More details about the cuff. A person may only enter the contest once. Thanks to D'Haute for the picture. very nice! good luck people! Followed all three steps and would looooove to won this one! Thanks for the chance, darling! oh my gosh, it will be such a dramatic piece on the wrist. How awesome is this! So sweet! That is a super beautiful cuff. I love it. I completed all the steps. Hope I win! Wow. That cuff is pretty amazing. What a giveaway! So unusual and glamorous. Don't worry about entering me Carrie, just popped over to wish you a fab weekend! Did all three, super excited!!! The texture of this one is sooo interesting!